Play in the snow, go hiking or visit Sedona and the Grand Canyon. Casita Bonita is a charming, romantic cabin in Northern Arizona. Located in Munds Park, 120 miles north of Phoenix, 20 miles south of Flagstaff, 40 miles east of The Village at Oak Creek in Sedona, and 90 miles from the Grand Canyon National Park; this is the perfect getaway. Casita Bonita has Wi-Fi, 50" HDTV with streaming with Hulu, Netflix, Pandora and Amazon, as well as Satellite TV. There are two smaller TVs each with DVD player or VCR. The entertainment center has more than 50 movies or VHS or DVD, numerous board games, as well as toys, legos, tinker toys and puzzles. There is a small stereo/CD player with a cable for iPod use. At the back of the property there is a horseshoe pit and a fire pit. Unlimited firewood is provided. (Please observe the fire department restrictions on "no burn" days for both the indoor and outdoor fireplaces.) Plan to cut your own kindling, please. The cabin sleeps six. Both bedrooms have quality linens and down comforters. The living area also has a black leather sofa which converts to queen-size bed with a memory foam mattress. For the gourmet cook, Casita Bonita offers an unusually well-equipped kitchen. A variety of cookware, spices, baking supplies and even condiments are on hand. There is a dishwasher, oven, microwave, blender, Krups drip coffee maker, coffee grinder, crockpot, and toaster, as well as a full size propane Weber grill. The dining table seats 8. While Casita Bonita is an upscale property: guests immediately feel at home in this cabin. Casita Bonita has received more than 115 Five-Star online reviews from past guests, all of whom highly recommended this property. Read through our reviews to see what guests have to say about Casita Bonita and about their great experiences in our home. The cabin is the perfect location for relaxation, for celebrations or for adventure. Enjoy Sedona’s famous red rocks. Visit Sedona’s Oak Creek Canyon where there are spectacular views, hiking trails, shops, restaurants, spas, and art galleries. In Flagstaff, guests can attend concerts, go to the theatre, or visit a museum, Northern Arizona University (NAU) or the famed Lowell Observatory in Flagstaff. Stay at Casita Bonita and ride the Polar Express on the Grand Canyon Railway. Watch the elk at sunset or fish (catch and release) at Lake O’Dell located just a mile and a half from Casita Bonita. Dogs are permitted for a small fee with prior approval. As the property owner, I am a hands-on manager. You will be delighted with the personal service and communication. The home is well-equipped and we want you to be 100% satisfied with your visit. Many travelers book this property for repeat visits. With over 100 five-star reviews you can be sure this property will delight you! I also manage two other Homeaway properties so be sure to inquire even if your preferred dates don't appear to be available. I teach school by day, but ensuring that you have a wonderful stay is a top priority for me! Cool and comfortable in the summer months, and warm and toasty in the fall and winter, Casita Bonita is the most delightful place to spend your vacation. This is a highly sought-after property. For the past ten years renters have continually given Casita Bonita a five-star rating. The house has a deck which wraps completely around with a covered deck, a covered barbeque area and a covered woodshed. There are views of trees from every window and the house is well-equipped and furnished. Customer service is a top priority and I want to be sure my guests always have a wonderful experience at Casita Bonita. Plumbing fixtures, towel bars and lighting are Venetian Bronze. Large stone fireplace. Firewood is provided. Parking in driveway and on street, adequate space for two cars. High speed Wifi delivered via fiber optics. Fluffy, clean white folded towels are stored in bathroom cabinets. High-Speed Internet provided by Century Link. Network key provided at the property. Clearstory windows and wood burning fireplace. 50" HDTV with 4k streaming. High speed wireless Internet. Delayed start feature and quiet operation. Electric range with coil burners. Modern Cuisinart drip coffeemaker with stainless steel carafe. Foulgers coffee is provided, but there is also a small coffee bean grinder. 4 slice Cuisinart toaster with setting for regular breads or bagels. Kitchen is stocked with seasonings, condiments, baking supplies, hot chocolate, tea and coffee. The cabin has decorative ceramic serveware, a crockpot, blender, cooking utensils and picnicware. Kitchen is equipped with gourmet serveware, seasonings, useful appliances such as a stainless steel drip coffeemaker, crockpot, coffee grinder, blender and an assortment of cooking/bakeware. Large dining table seats 8 comfortably and features sturdy, comfortable chairs. Dining room fixture may be dimmed for cozy, intimate dinners. Scrabble, Clue, Rummicub, cards, poker chips, Monopoly, dominoes, puzzles and toddler games. Tinker toys, Lincoln logs, wooden blocks and two sizes of Legos. Lincoln logs, Legos and Tinker Toys. More than 50 movies, in both DVD and VHS format. Bird feeders in front and back of property. Birdseed stored in hall closet. There are Kayaks for rent at Lake Mary in late Spring, Summer and early fall. Front deck is sunny and secluded. Large covered deck has a porch swing and a large patio table with rocker chairs..
Water gear is NOT provided but THERE ARE four BEACH TOWELS for guest use. Guests must request since the towels are in storage area. No additional charge. Skiiers and snowboarders enjoy beginner, intermediate and advanced slopes at Arizona Snowbowl, just a few miles north of Flagstaff. Arizona Snowbowl also has equipment rentals. Renters may pay a weekly fee to obtain full privileges at Pinewood Country Club. The club is open May to November, weather permitting. Renters may pay a weekly fee of $210 to obtain full privileges at Pinewood Country Club. The club is open May to November, weather permitting. Casita Bonita has a large deck that wraps around the entire cabin. The cabin is surrounded by trees. Decks are both shaded and sunny with seating on the north and south sides. Barbeque on the covered patio using the three burner propane Weber grill. Dine inside or out. Linens and serveware are perfect for either! Play horseshoe in the area off the back deck, build a fire in the outdoor firepit and roast marshmallows or head through the gate at the end of the street to access miles of hiking trails in the Coconino National Forest. This place is immaculate! We have stayed here before and this time was no different. Everything you need and then some. The cabin is very clean, comfortable beds and oh so cozy!! Will definitely be back! Kids and us had a great time and it snowed, we sledded, we had a campfire and roasted marshmallows, and we got to use to TV in the living room to watch the NFL playoffs for a little bit of technology while still getting “away from it all” kitchen had what we needed to make breakfast and coffee daily. Thanks! My husband and I were incredibly happy with our stay here. It's in close proximity to all the northern Arizona cities and sites everyone comes for, including Sedona, Flagstaff, Grand Canyon, and Antelope Canyon, but feels remote and cozy. We absolutely recommend staying here! Just a lovely home and the perfect place for us to spend Thanksgiving with the kids. Comfy beds, plenty of room for us all. Tons of counter space and a lovely dining table and fire place. It was perfect!! Thanks so much! Beautiful, Comfortable, and very well equipped!! Nicely located near Sedona, Grand Canyon, and various location. The home is beautiful and the owner was easy to work with and gave great thought in making our stay comfortable. We highly recommend this accommodation. 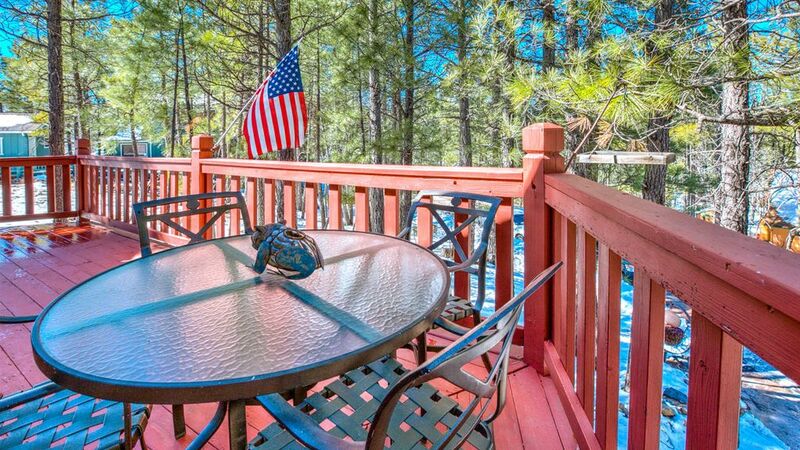 Casita Bonita is located in Munds Park, 20 minutes south of Flagstaff. Go to Flagstaff to enjoy movie theatres, restaurants, shopping, museums, and observatory. The Grand Canyon is 90 miles northwest, and the Village at Oak Creek in Sedona is 40 miles from the cabin. The Arizona Snowbowl Ski resort is outside of Flagstaff, just 30 miles north of the cabin. There is a zipline/obstacle course north of the cabin, and the famous "Montezuma's Castle" Native American ruins are just 30 miles south. Hikers and sight-seers will want to visit the spectacular red rocks in Sedona. Sedona also has an outlet mall, high-end boutique shops, spas and restaurants. The south rim of the Grand Canyon is just 90 miles away. High country adventurers may also want to drive to the historic four corners area. Northern Arizona State University is just 17 miles north of the cabin. Golf: Pinewood Country Club is located one mile from Casita Bonita. It is an 18 hole championship golf course. Contact the club to arrange for public play (928) 286-1100. Individuals who play golf may also be able to dine at the country club on the day of play. PWCC is open May to November, weather permitting. Families and couples can have full access to dining, swimming, golf, organized activities in the recreation center, workout room and tennis courts on a weekly basis for just $210 per week. Ski: The Arizona Snowbowl is northwest of Flagstaff. Daily lift tickets are approximately $75. Ski and snowboard equipment rental locations in Flagstaff and at Arizona Snowbowl. There is also an area for sledding west of Flagstaff called Wing Mountain Recreational Area. Rates are subject to change until reservation is confirmed. Please note that weekly stays are preferred during summer (high season) and holidays. There is a four night minimum for major holidays. Check in days are usually Friday and Sunday, however, owner will consider exceptions if requested. Two payment plans usually can be arranged if requested. Thank you.